Preheat oven to 350°F. For cake, cream together butter and sugar in a mixing bowl with a hand mixer (or with a stand mixer with the paddle attachment) until it’s light and fluffy. In a separate bowl, whisk together flour, baking powder, and salt. In a second bowl, whisk together egg whites, milk and vanilla. Add about 1/3 of the dry ingredients to the creamed butter. Mix that in on low speed, then add half of the wet ingredients. Add another 1/3 of the dry ingredients, followed by the rest of the wet ingredients, followed by the last of the dry ingredients. Mix until the batter is just combined and smooth. Try not to over-mix. Transfer batter to two 9-inch cake rounds that have been lightly buttered and floured. For easy removal, line bottom of cake pans with round parchment paper. Bake cake for 25-30 minutes at 350°F until lightly brown around the edges and a tester comes out clean. Remove cakes and let cool for a few minutes, then remove cakes from pans and let cool completely on wire racks. For ganache, heat cream until steaming and pour over chocolate chips. Let sit for 5-10 minutes until chocolate is completely melted. Stir together until smooth. Let chocolate cool to room temperature and then transfer to a stand mixer (paddle attachment) or use a hand mixer to whip the ganache until it almost doubles in volume. 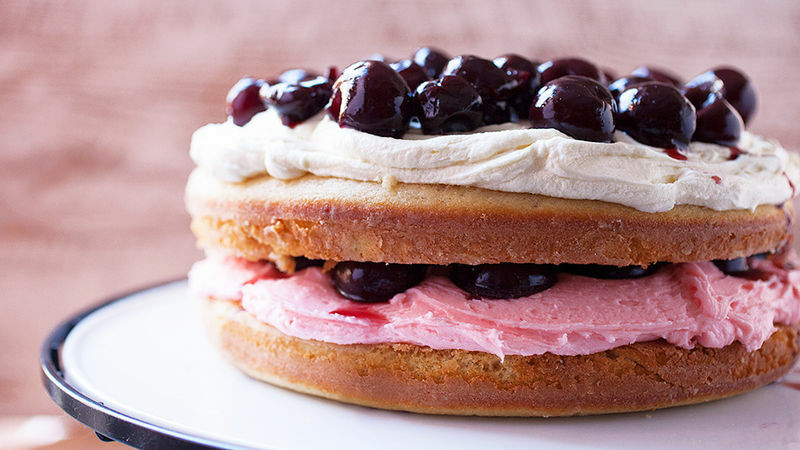 For cherry frosting, beat until light and fluffy with a hand mixer or with a stand mixer (paddle attachment). Slowly add in grenadine and milk. Next, add in powdered sugar in 1 cup batches until frosting is light, but firm and holds its shape. To assemble the cake, lay one cake on a clean cake plate. Top with cherry frosting filling and half of the thawed and drained cherries. Top with a second cake, followed by the white chocolate ganache spread evenly over the cake. Pile on the rest of the fresh cherries.